Vientiane (VNA) – President of the Vietnam Fatherland Front (VFF) Central Committee Tran Thanh Man had a meeting with Chairwoman of the Lao National Assembly Pany Yathotou on August 11 as part of his working visit to Laos. 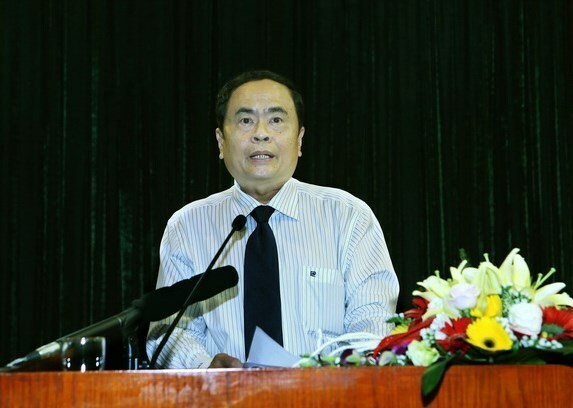 Man said Laos is the first country he has chosen to visit since taking the top position at the VFF, and vowed to do his best to contribute to the special solidarity and comprehensive cooperation between the Parties, States and people of Vietnam and Laos as well as to the ties between the two countries’ front organisations. He informed the host about the outstanding development of the ties between the VFF and the Lao Front for National Construction, saying that the two fronts have regularly held exchanges and share working experiences. The two organisations will continue to work closely to successfully implement joint plans for 2017-2020. The VFF leader took the occasion to ask the Lao NA leader to help create more favourable conditions for overseas Vietnamese in Laos to acquire Lao citizenship or long-term residential status, and reduce fees and simplify procedures for them in registering marriage, labour and business, as well as in applying for alien resident status. Man also urged the two countries to enhance transport connectivity, invest in border gate infrastructure and continue to collaborate in the search for and repatriation of remains of Vietnamese voluntary soldiers and experts who died in Laos during wartime. Chairwoman Pany Yathotour said she supports the VFF President’s proposals, stressing that the two countries should work to preserve their one-of-a-kind special ties.